What kinds of desserts can you make to celebrate the 4th of July? Cake pops of course! 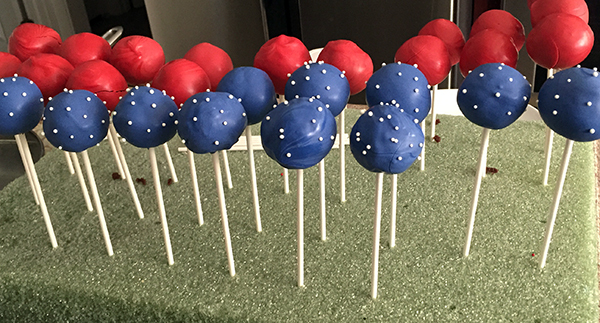 Plus, these "Stars and Stripes" cake pops can be done at any baking level. I used the extra cake I had left over when making my Death By Chocolate cake. 1 container of chocolate or vanilla frosting. I used vanilla. Bake your chocolate cake. We're going to be mixing it with frosting so don't worry about how it looks as long as it's cooked all the way. Let the cake cool and then mix it together with 2 tbs of frosting. You can add more frosting as needed. You don't want the cake to feel slimy from too much frosting, but you also want to make sure it stays together. I started with cake scraps from another cake so the picture above starts off by mixing the cake with the frosting. Roll the cake into individual balls. I used a 1 tbs scoop to measure out the cake balls. Wrap them up in cling wrap and stick them in the fridge to solidify for at least 30 minutes. When the pops are ready to start dipping you can start preparing the candy melts. 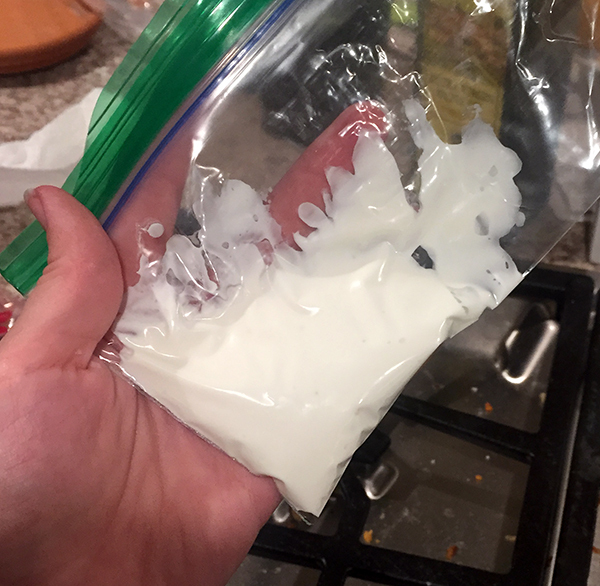 I used the "informal" double boiler method with a bowl placed over a saucepan filled with 2 inches of water. Turn the heat to medium-low and add in some shortening, or paramount crystals. Mix until the chocolate melts have melted and everything has combined. Take your cake pops out of the fridge. Dip the top part of a cake pop stick into the chocolate melt, and then stick that into a cake pop. Don't puncture the top of the cake pop. Stick them back in the fridge for a minute or two so the chocolate fully hardens. Next, dip the cake pops into the melted chocolate. I try to dip the cake pop in and out as fast as possible so the cake doesn't melt off the pop. 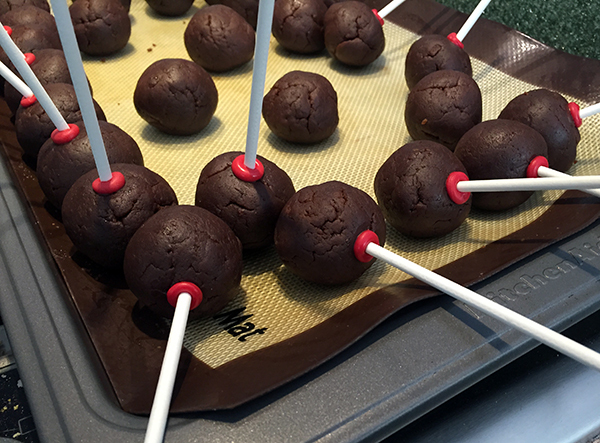 Lightly tap the stick of the cake pop to get any excess chocolate off. 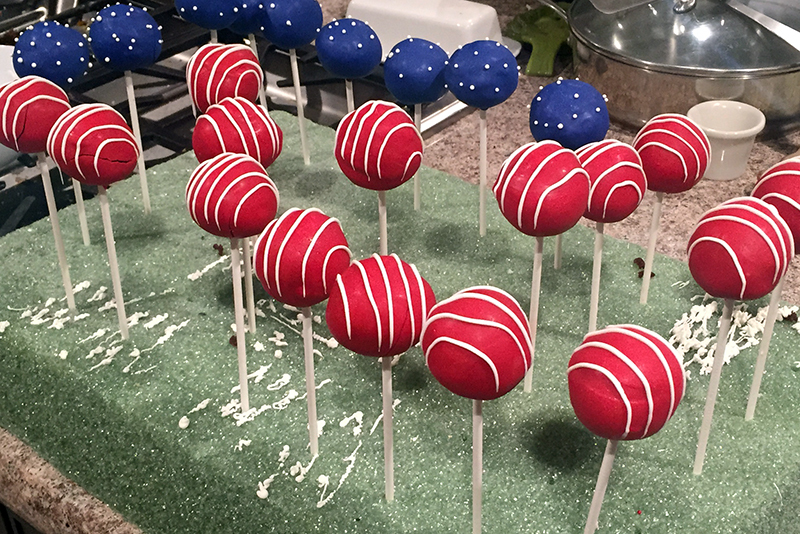 Repeat the process for the blue cake pops, but cover them with white sprinkle "stars" before the chocolate coating dries. Let them all dry completely. 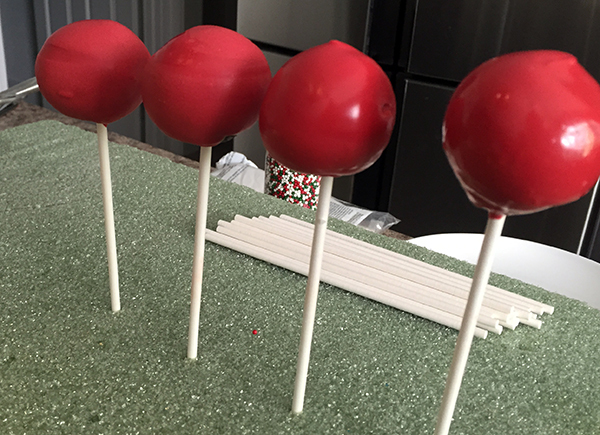 Time to add the stripes to the red cake pops. Melt up some white chocolate or white candy melts. Place it in a small Ziploc bag and cut the tip off one of the corners.